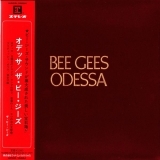 Warner Music Japan : Cardboard sleeve reissue from Bee Gees features the latest remastering. Features a mini LP faithfully replicating the cover artwork of the original UK album. Comes with a description and lyrics. Part of 10-album Bee Gees cardboard sleeve reissue series features the albums "Bee Gees 1st," "Horizontal," "Idea," "Odessa," "Cucumber Castle," "Mr. Natural," "Main Course," "Children Of The World," "Here At Last... Bee Gees... Live," and "Spirits Having Flown."